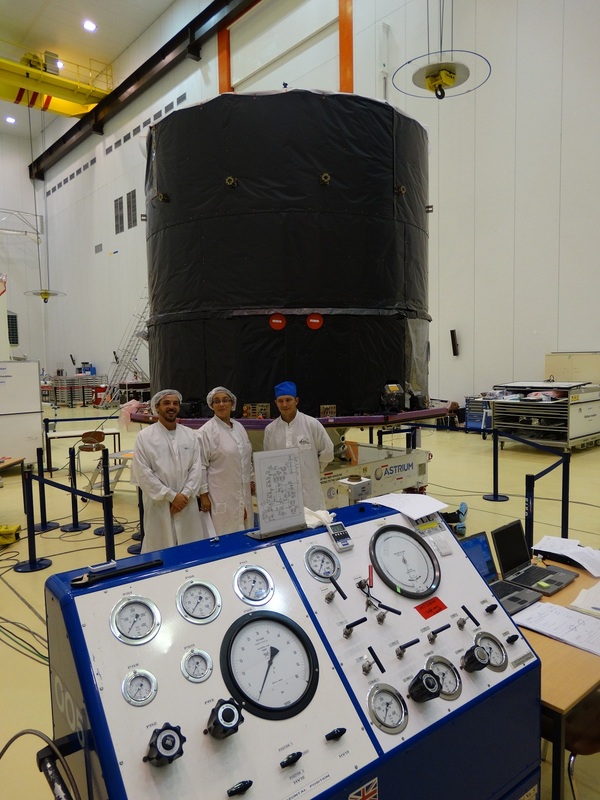 As soon as brought out of its transport container, Gaia’s verification and preparation for launch could start. The first verification activity allowed to confirm that transport did not impact the alignment of some sensitive equipment like thrusters and star trackers. Then, the Astrium Stevenage team took over and verified the functionality and leak tightness of Gaia’s propulsion systems. This is a must to comply to safety before pressurising gas tanks and loading propellant tanks with dangerous fluids. The picture shows the set-up of the spacecraft in the S1B clean room connected to its fluidic equipment. The next step is the electrical verification. A number of new participants just arrived to support the activities in two shifts on all electrical subsystems. In the meantime, all necessary support equipment has been validated and we’re now ready for the first spacecraft switch-on in Kourou.